Dún na Séad castle was built in 1215 and has had a long and fascinating history. It fell into a ruined state in the middle of the seventeenth century, however, and remained a ruin until recent works of restoration, which began in 1997 and continued until 2005, made it habitable once again. The following is a brief account of its history to the present day. In 1169 the Normans arrived into Ireland and one of the first to arrive with Strongbow was Robert FitzStephen. Within a few years King Henry ll granted FitzStephen half of the kingdom of Cork to settle a colony in the area. This FitzStephen adopted many Irish customs and assumed the Gaelic form of his name ‘MacSleimhne’. 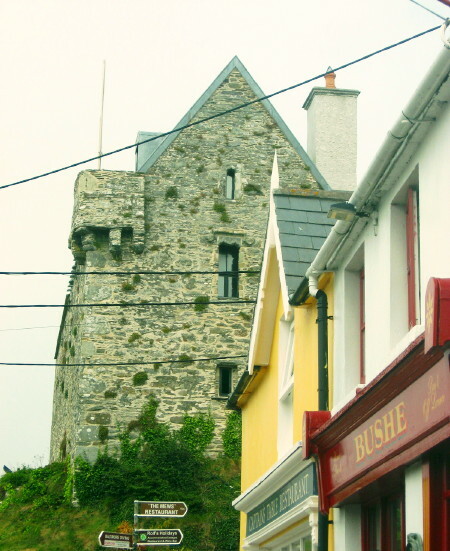 His grant of land passed through his descendants who intermarried with the Gaelic clans, (Richard married Raghenilda MacCarthy, daughter of the local chieftain), and in 1215 it is recorded in the Irish Annals that Dún na Séad castle in Baltimore was built by Sleynie, a descendant of Robert FitzStephen ‘the conquistador’. The Norman settlers thrived, until in 1261 the Irish clans rebelled at the Battle of Callan and gained a great victory against them, ousting them from their newly-built castles. Even though documentary evidence of the O’Driscolls in the thirteenth century is scarce, it was probably soon after the upheaval at the Battle of Callan that they took possession of Dún na Séad and their former lands around Baltimore. The castle became the main seat of the O’Driscolls for the next four hundred years. It was used as a centre of administration for trading activities and collection of taxes from foreign traders frequenting the port. In the middle and later-middle ages therefore, the O’Driscolls enjoyed a prosperous lifestyle. Lavish gatherings took place in the ‘great hall’ of Dún na Séad castle and a well-documented feast in 1413 is said to be one of the earliest records of people dancing in Ireland. This documentary evidence is supported by archaeological finds from recent excavations of the Dún na Séad site, which reveal the presence of late twelfth to fourteenth century pottery from the Saintonge region of France, and reflect the lucrative trade links between Baltimore and Europe at this time. By 1601 the political situation was changing, and the years of prosperity for the Gaelic clans were coming to an end. Sir Fineen O’Driscoll allied himself with the Spanish at the Battle of Kinsale and handed over Dún na Séad castle to Don Juan del Aguila. The defeat at Kinsale resulted in Dún na Séad being handed over to Captain Harvey on behalf the English crown. The Algerian pirates did not reach the castle at the time of the Sack of Baltimore in 1631, but on 15th August 1642 the castle is recorded as sheltering 215 of a new wave of English Planters against Catholic rebels such as the Coppingers and the O’Driscolls, who made repeated, unsuccessful attempts to gain entry. Soon after this, in 1649, Oliver Cromwell arrived in Ireland and took the castle as a garrison for his troops. Dún na Séad fell into a gradual state of decline after the departure of Oliver Cromwell’s troops. The building and lands can be traced in title to the present day to the present owners, Patrick and Bernie McCarthy, who began the work of restoration in 1997. The restoration was completed in 2005 and the castle is now inhabited again for the first time since the middle of the seventeenth century. It has been restored following the original design, which was revealed through a study of the remaining features. The ‘great hall’ on the first floor retains its original two fireplaces and original dressed sandstone windows. Corbels on the walls reveal the existence of two second floor galleries, which have also been included in the course of the restoration. Some remaining mortar on the internal walls was analysed to ensure consistency, and the external stone work has been pointed using the same lime mortar base. All timber is green oak, as would have been used in a building of its era. The original battlements were retained and now afford a panoramic view over the modern harbour of Baltimore. In the course of reconstruction, and in accordance with licensed archaeological digs, the original well, which had been lost for hundreds of years, was rediscovered. A cobblestone yard, a portion of which is visible in the bawn, was also rediscovered, revealing a pistol shot, dating from the seventeenth century. This is but a small indication of the castle’s varied and sometimes troubled history. Since completion, the castle has welcomed many visitors, particularly during the summer months. It has been a venue for O’Driscoll clan gatherings, Fiddle Fair recitals and various talks and lectures. At the beginning of the twenty-first century Dún na Séad castle has reawakened from its 350 years of inactivity, and is celebrating its rebirth into the Baltimore of the future.